The Atari 400 and 800 were by far the best gaming computers when they hit the market. This was largely due to the awesome ANTIC graphics chip designed by Atari engineers. ANTIC made it possible to put many colors on the screen and enabled Atari’s famous player-missile graphics. In addition to the awesome graphics and sound, Atari also had the best joysticks. The Atari joystick (CX40) was so popular that other computer makers such as Commodore included Atari’s joystick ports on computers such as the VIC-20. Interestingly, Commodore originally tried to copy the Atari’s joystick and was taken to court. Here is a 1982 piece in InfoWorld about this. Here is the Wikipedia post on the famous Atari joystick port. 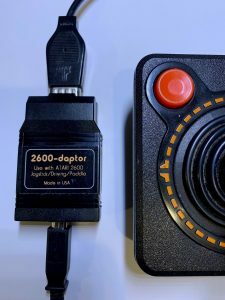 I still love Atari joysticks and at some point decided I wanted to be able to connect them to my PC so I could use them to play games on the 800 and 2600 emulators. Using a keyboard just isn’t the same. There are several options available if you poke around online. I went with the 2600-daptor. I have no idea if this is the best one but it works well for me. Purchase an Atari joystick USB adapter for your PC. I went with the 2600-daptor that sells for $25. There are several modern Atari-like joysticks with USB cables available online (e.g. Amazon). I am not going to post the links here because the reviews are terrible. I don’t have any personal experience with these. I have a box of the original ones and find the adaptor to work really well. Enjoy!